The video is going viral. It’s garnered literally a million new views since I saw it 12 hours ago. It’s an 8th grader’s graduation speech. This is no grad speech I’ve ever heard. His name is Jack Aiello, and he just graduated from Thomas Middle School outside of Chicago. 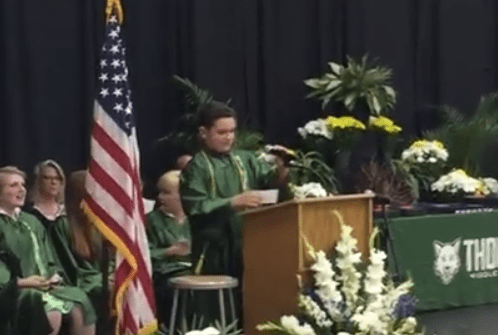 This kid nailed the mannerisms of presidential hopefuls Trump, Cruz, Clinton, Sanders… and even our current commander in Chief. Sure, the kid is only in 8th grade and the voices aren’t dead on… but he’s truly got a gift impersonating the mannerisms. Previous PostPrevious Are Today’s Teens Taking Less Risks?